Help, I’ve already had two Christmas lunches and a carol service and Christmas is still three weeks away. I suppose it doesn’t matter that much – not one has died as a result of not keeping Advent. However, it was suggested that perhaps we get so caught up with Christmas and the celebration of Jesus’ first coming, that we lose sight of the other meaning of Advent. As well as looking forward to Christmas there is looking forward to Jesus’ return, his second coming, just as he promised. I sense (and this includes me) that many Christians may well nod in agreement with the idea of Jesus’ return and yet. And yet, while we may still be waiting, we have given up expecting him. So as a reminder to myself I re-read this old Advent hymn. It was written around 500 years ago by John Milton. As with all poetry, it is better read (or sung) out loud. I was going to call this poem a “sonnette” because my original intention was to write a sonnet. However, I was too impatient to shape my ideas into a sonnet form yet I did want it to resemble one. “A little sonnet” or a “sonnette” seem a bit too pretentious for what is really just a run-of-the-mill poem made from lines thrown together in the midst of some Bible study. It is a snap-shot of my thinking process: half-baked, you might say, but then again, some people enjoy the sauce that comes with the not-quite-baked sponge pudding. The occasion is when Elizabeth and Zechariah, who are both too old to have any children, are both told that they will have a son – the person we have come to know as John the Baptist. He was born some six months before Jesus; Elizabeth was Mary’s sister, thus making Jesus and John cousins. The miracle of John’s conception forms part of the overall story of God coming to us as a human being, the incarnation, which we celebrate at Christmas. There is keeping one’s counsel and there is being lost for words. There are some children’s hymns and songs which seem rather twee and the one I am sharing with you could easily fit into that category. However, the other day, as the grey clouds lowered and it grew gloomier, I found myself whistling the tune and repeating “You in your small corner, and I in mine”. It is not a complete theology by a long stretch but it is cheerful enough if you know the tune. The general point is that Jesus, the light of the world, is with us during our daily tasks, no matter how dark and dull it is outside. You in your small corner, and I in mine. I realise that the migrant/refugee crisis in Europe has various causes and a variety of solutions; I also acknowledge that Europe does not have a monopoly on human suffering. Having said that, one thing I agree with our bishops on is the need and value of prayer. Here is one which we have adopted in our churches. when all will rejoice in your Kingdom of justice and peace. to welcome the stranger and love them as ourselves (Leviticus 19:34), and to seek the peace and justice of our God, in our world, today. The other day I thought to myself that tourism is a luxury only the relatively rich can afford and this post started out as a note to say that tourism is unbiblical. Until I thought about it. Now, there is the principle of taking a rest (Sabbath) and time for family and recreation free from the obligations of working for a living (see the fourth commandment in Exodus 20 verse 8 or Deuteronomy 5 verse 12) so having a holiday seems OK.
You do not have to look to far to see people taking a journey whether it is to a new land to live in, as with Abraham, or to visit the baby Jesus, as with the Magi. Going on a pilgrimage to a special place because you believe God has sent you or because of a holy association seem to be OK as well. But tourism? Visiting places out of sheer curiosity or going somewhere new to get away from it all? Well, I think I have found two instances which seem to suggest that going as a tourist is OK – at least some times. 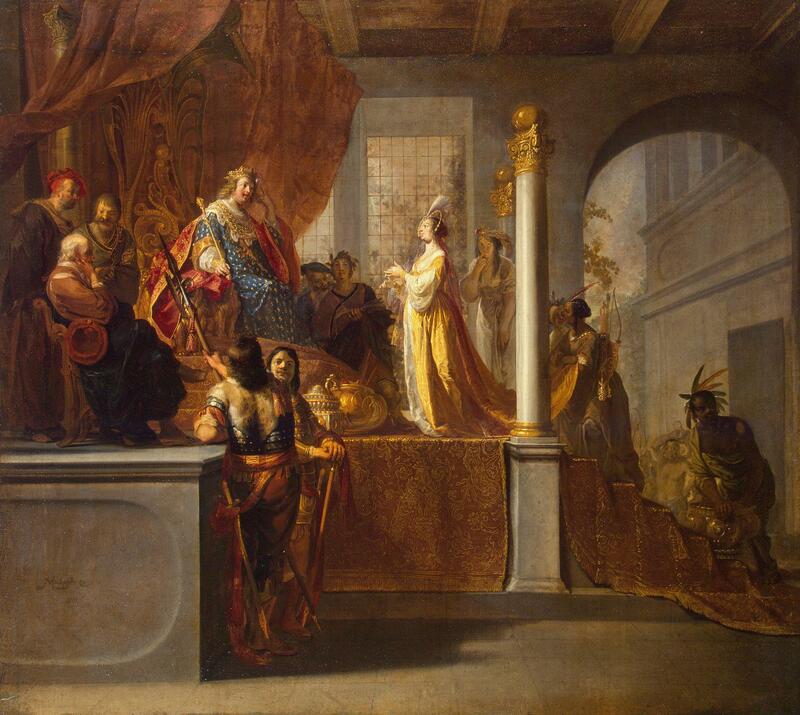 When the Queen of Sheba heard about King Solomon’s fame, her interest is piqued. So she sets off to see for herself. It seems to me that curiosity was her motive. In the end she discovered that what she had heard was no exaggeration and she was suitably in awe of what she saw. Now one person’s curiosity is another person’s nosiness, so we do need to stop and check our motives. However, I think that a desire to learn, to discover new things, to allow ourselves to be challenged by new people and places etc is acceptable – so long as we are respectful of the people we meet en route. The other day, when reading and studying Mark chapter 7, I saw something that I had not properly appreciated even though I had read that chapter several times before. At first glance in the gospels, Jesus appears very busy and appears to have little time to eat and sleep let alone take a break. That is understandable as it would be a very slow read if we had to plough through details of every meal and every time he went to the bathroom! Having said that, there are a number of times when Jesus does take time out, usually to pray. If we follow Jesus, having proper rest periods is part of our calling. But in the middle of Mark chapter 7 Jesus does not just have a rest: he goes abroad to another country where people will not recognise him. In other words he takes a foreign holiday. Jesus’ “holiday” is not like ours. For a start he probably walked. For another, his holiday was briefly interrupted by a “foreigner” who asked him for help. His response is instructive. At first he says “no” but when the woman shows that she is serious, he then grants her request. What he does not do is say, “Now that is my holiday ruined, I might as well go back to work”. That is another lesson for us. If our holiday is interrupted and there is no one else on hand to help in a particular situation, then it is OK to help out. But that is no reason to go back to work – continue with the rest of the holiday. So the Queen of Sheba travelled abroad to satisfy her curiosity and Jesus went abroad to get away from it all. I therefore conclude that being a tourist on a foreign holiday is permissible. There are not many stories that I know off by heart but “Twice Mine” is one of them. I remember hearing it told by a lady who explained that it was one of her own children’s favourites. On the face of it this is a straight-forward story for children about loss and recovery. You can also hear it as a parable of God’s love for us as our Creator and our Redeemer. There are a number of versions on the web, this is just one of them. When I told the story at church recently someone asked a pertinent question: what did the little boy do after he had recovered his boat? Did he put it on a stand in his bedroom to admire it and to keep it safe? Or did he take it sailing again? Heavenly Father, we thank you that you made us and that you save us. May we always know that you are with us both in stormy times and calm times. Help us to share your love and peace in the world around us. We ask this in Jesus’ name. Amen. … so you decide to clean the mirror. I recently attended a day course to raise awareness about domestic abuse. This is something I knew existed but, like many people I suppose, I assumed that it was rare and did not affect anyone I knew. You see, domestic violence, which is one kind of abuse, does not broadcast itself on the estate where I live. It all happens in another part of town. Well, I learnt that that is just not true. The statistics were frighteningly high and there are psychological abuse and financial abuse as well as the more-reported sexual and physical abuses. My fellow students and I did struggle with some definitions. We could see how some incidents in isolation, while still wrong, did not amount to a pattern of abuse. For example, a sarcastic remark, a put-down, a criticism of your partner’s appearance is something many of us have said or heard – and regret afterwards. And it would be easy to excuse someone’s poor behaviour with a dismissive “but we’ve all done that” or, worse, ” what goes on behind closed doors is none of our business”. The fact is that criticism can be used to put someone in their place and keep them there. The jokes at their expense gradually undermine their self-confidence until there is little of none left. Gradually, you have them under your control.The abuse is verbal and not a single smack of the fist is needed. Then there is money: who controls the purse strings? Now, we had some discussion about this because some of us recognise that in some marriages one person may be more competent/confident in managing the money. That is OK if you are in the habit in trying to explain what is going on from time to time, insist that both of you see the financial advisor and you do not have everything in your own name: there must be some discretion for each of you and a level of trust that does not have to account for every single penny. By contrast, we heard about one instance where one partner worked and earned more than the other. The man took both their wages and she had to ask for some of her own money back – which he resisted and resented. To help make the distinction one member of our family said that it was one thing to be in charge of the money and another to be in control. In other words, one of us might be responsible for the finances but not in a dictatorial sort of way. There was a lot more in the course but I think one of the key lessons was to realise that abuse is the result of one partner/family member wanting complete control over the other. It was as if they saw themselves in the other person and did not like what they saw. So, instead of sorting themselves out they tried to sort the other one out: “When he sees his dirty face in the mirror, he cleans the mirror”. The message for the church is two-fold. Firstly, if we want our churches to be safe places for people to come then we need to recognise that it is likely that there are some in our congregations who are abused or who are abusers: their public persona may be wonderful and they may even be in church leadership. There are a number of places you can go if this affects you. I found this link to restoredrelationships.org worth a look. In this country there are now dedicated units in the police, the National Domestic Violence Helpline and Childline as well. For the churches there is also the Churches’ Child Protection Advisory Service (CCPAS) with further advice and information. Incidentally, we learnt that while most domestic abuse is perpetrated by men on women (for which there is most research, and hence the main focus of our course), there is also abuse women on men; by men on men and by women on women.